Your final Template will look something like this. Q: I am using Photoshop Elements 8 to make custom size (5x7) note cards on 7x10 stock with my photographs. how can I create my own template for repeated use of my card format? A: Follow these steps for creating your own template. This looks like it's a long process but some of that is because I tried to include lots of detail so that beginners could follow it. Plus once you create your template you can use it over and over again with new photos and other elements. Go up to the File menu and choose New>Blank File… to open the New dialog box. In the Name field at the top give your document a name that you'll recognize like notecards_template with _template being the essential part of the name. Enter the Width and Height you want your document to be. In your case 7x10. Now enter a Resolution. Most home inkjet printers will produce good quality prints at 225 pixels/inch. But if your going to have them printed at a commercial printer type 300 in the Resolution field. Click OK. Your new blank document will open in Elements. Go up to the View menu and choose Fit on Screen. Now go back to the View menu and choose Rulers. 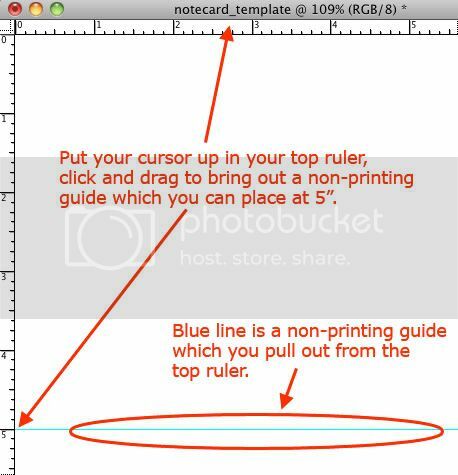 With your Rulers visible at the top and left side of your document you can click and drag a guide down from the top ruler and place it halfway down your page (at 5 inches). Now we'll create a new layer for each card's photo. 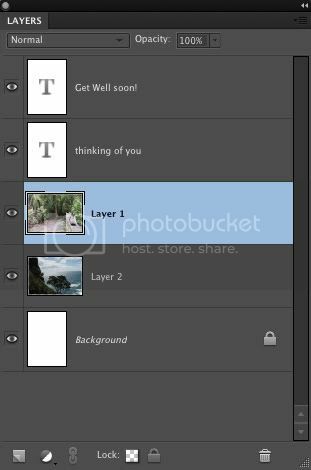 Go to the Layers Panel and click on the little square icon with the curled corner to create a new layer. Choose the Elliptical Marquee tool from the Toolbox by clicking on it. Go up to the Options Bar and from the Mode pull-down menu choose Fixed Size. By default the dimensions are given in pixels. You can change it to inches by typing in after the number you enter. You probably don't want to have your photos go right to the edge of your cards because it can cause problems for printers, but I'll leave that up to you. I recommend leaving a quarter inch border around the outside of your card. In this case we want 1/4 inch around all four sides of the card so we subtract 1/2 inch from the total width and the total height. That leaves us with 6.5 x 4.5. Now if you place your cursor at the upper-left corner 1/4 inch in from the edge (you can use the rulers as a guide) you can click once and get a selection the exact size you specified in the Options Bar. If you need to move it, just click inside the selected area and drag it. for the first card (you will now have 2 documents open in Elements). 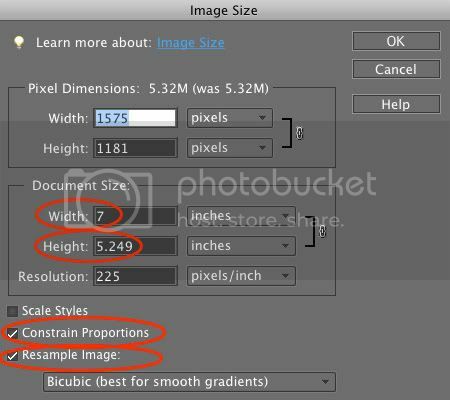 Go up to the Image menu and choose Resize > Image Size…. In the Dialog box in the Document Size area enter the same Resolution you chose in Step 3 (probably 225 or 300) into the Resolution field. Make sure Resample Image is NOT checked. Click OK.
Now we need to go right back into the Image Size Dialog box. So choose Image menu > Resize > Image Size…. This time we will resize the photo. in the Document Size area put in Width and Height dimensions as close to 5x7 as you can without going smaller than 5x7. You might need to make one dimension bigger to get the other dimension big enough. Make sure Constrain Proportions and Resample Image is checked. In the Image Size dialog box above I entered 7" into the width field and to keep my proportions correct I can see that the height will be 5.25". That's fine as long as one of my dimensions isn't smaller than the 5x7 I want. It does indicate that I will be cropping off some of the height, but it's the best I can do without distorting the photo. Click OK.
Go to the new document you created earlier in Elements. It should still have the selection active in it (if not, see Step 5 above to activate it). Go up to the Edit menu and choose Paste Into Selection. Your photo will show up within the selected area. At this point since there is some parts of the photo outside of the selected area you can use the Move tool to position it as you like. When you're happy with the position, Deselect by pressing Control-D (Mac:Command-D) to commit to the position. 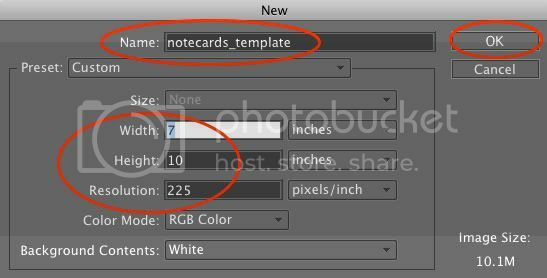 Go back to Step 5 to create a new Layer for the bottom card in your template. 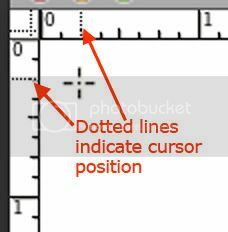 Of course you will make your selection this time by placing the cursor at 5.25 inches before you click the Marquee tool. Now you might want to add a layer for type. Just click inside your document with the Text tool where you want it to be and start typing. It will automatically be on a new layer. If you want other common artwork to be on your Template just create a new layer to put it on. One main key to making this a Template is to have each element on its own Layer. You're finally ready to Save it as a Template! 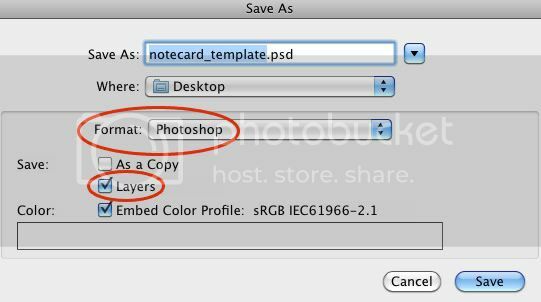 Go up to the File menu and choose Save As…. 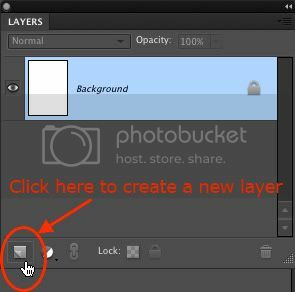 Choose Photoshop in the Format field and make sure Layers is checked. I decided to do a second part to this tutorial to show how to actually use it as a template. Look for that coming soon. Thanks for a great question Elizabeth. This has been the most helpful lesson I have ever found online .... and I have been looking. The extra detail is so important. Thank you. Glad you found it helpful Claire, thanks for taking the time to comment! Very helpful Rick! Just in time for 97 year old birthday celebration.